Costas Vainanidis, member of the Athens Bar (admitted 1976), partner. Studied Law (LL.B) and Political Sciences (B.Sc.) in the University of Athens and was awarded a Masters in Laws (LL.M). from the University of London. His practice includes litigation before Greek and International Courts and advising on Anti-trust and Unfair Competition Law, Franchising, & Agency, Mergers & Acquisitions, Commercial and Company Law, Private International Law, Public Procurement, Public Works, Food Law, Labelling, Medical Law, Product Liability, Consumer Protection, Real Property and Law of Succession, etc. 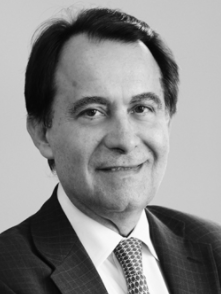 He is a member of the Editorial Advisory Board of the Competition Law Review (Sweet & Maxwell) since 1981. His articles and contributions appear in several international comparative law projects on anti-trust law, corporate acquisitions and mergers, distribution, company law, insolvency, civil law and law of succession, published by Sweet & Maxwell, Butterworths, Graham & Trotman, Kluwer, J.Willey & Sons, ESC Publishing Ltd., the ABA, the IBA etc. He has addressed more than fifteen International Anti-trust Law Conferences in Athens, Oxford, Cambridge and Madrid. He has given educational lectures to the staff of the Secretariat of the Greek Competition Committee and advises the Athens Chamber of Commerce and Industry on competition law matters.